I think I’m beginning to understand what people mean when they say that the pacing of My Hero Academia is very slow. 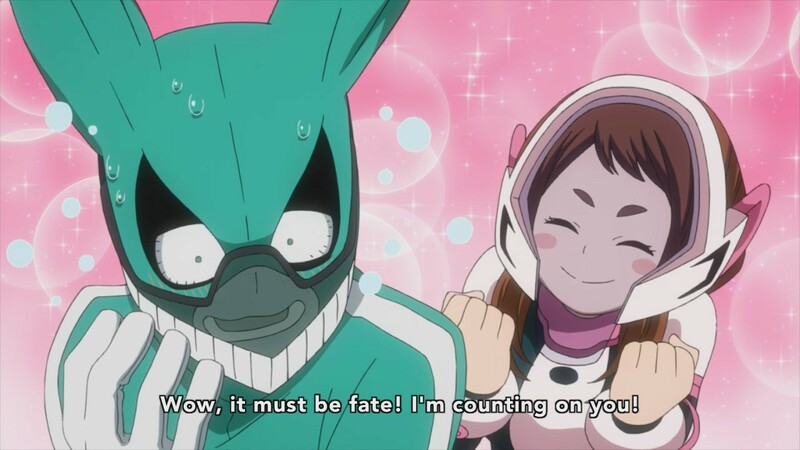 In retrospect, it would seem that MHA has achieved very little come the mid-point of its season. We got two episodes worth of background on what drives Deku (yes, I’m adapting his moniker, and for good reason as we see later), another episode on him training up in order to receive All for One, one episode for the entrance examination, and now two episodes that basically follow the formative “rites-of-passage” for Deku and his fellow superhero classmates. That certainly sounds like something that could have been condensed into half the number of episodes, but for what it’s worth, MHA has remained consistent in highlighting its core values to the point of excess. Episode six continues this trend, now pitting Deku directly against his childhood friend Kacchan. But then the episode ends. It’s a little frustrating, but oh well. What can you do? This is a major serialization we’re talking about, so the decision to drag out the show is probably standard play when it comes to translating it into the anime format. I’m probably not in the best position to comment on how well this translation is going given I haven’t even read the source material, but perhaps what I can (and will) focus on instead are the themes of formative education — a central theme that I believe deserves a little in-depth discussion. Modern education has always created a sort of division in society between the academics and the non-academics — the “smart people” and the “non-smart people”. We’ve been told that in order to get a job in society, you need to get a degree — and even before that, go to school and get good grades, because that’s what your parents did and they know what’s good for you. This has lead to brilliant people thinking that they are not, simply because the very educational structure does not value them to be of any merit. And it isn’t this way because they want it to be, but because it just so happens to be that way. In the words of Sir Ken Robinson, “it was an intellectual model of the mind, driven by the idea that real intelligence consisted of a certain capacity for deductive reasoning and knowledge of the classics, collectively referred to as Academic Intelligence.” It is this desire for Academic Intelligence that fuels the machinery of modern education to run the way that it does, but for many reasons has been inadequate in serving the overarching goal of forming the children who will eventually become the future of our society. My Hero Academia takes this view of education by translating the intellectual model of the mind into a intellectual model of the hero, creating a dichotomy similar to academics and non-academics. There are those born with Quirks and those without it — Heroes and non-heroes. At least from our perspective as viewers, it’s easy to make that distinction given we were raised in the academic environment of the intellectual model of the mind. But the show has been consistently challenging this model, pitting a different ideology that values a heroic attitude not defined by the presence or absence of a Quirk. And it does so by utilizing an actual academic setting in order to get the idea across. And so the name My Hero ACADEMIA is actually very fitting. It could have been any hero show that simply zeroes in on an underdog character who espouses the true values of a hero in contrast to its in-house worldview of heroism. This sort of structure is what makes for the stories of Batman and Ironman, or pretty much any superhero who lacks a superpower. They are not superHUMAN, yes, but that does not preclude their capacity to become a superHERO. That in itself is no novel idea, but what makes MHA different is in its decision to put all of this in the context of an academic institution. Hence the intellectual model of the hero. Even the characters in the show are raised in the mindset that heroism is equated to one’s essential capacity to display control over a quirk. Kacchan is living proof of this principle — that if you blow up as many enemies as you can and flash your superpowers as wildly as possible, you can be a hero. It’s the same principle that drives academicians to strive for excellence, perfection, and praise. And you can’t blame the system for being that way. As much as many people would like to believe that grades don’t make the person (because they certainly don’t), the reality of job placement and grant approval relies solely on this one moment display of intellectual aptitude. To a certain extent, it’s a necessary evil. Grades certainly aren’t everything, but that doesn’t mean that they don’t mean anything, either. Similarly, Quirks are not everything, but that doesn’t mean they aren’t needed. And that’s why Deku’s character is so important. He is the middle ground in the battle between academics and non-academics — between those with quirks and those without quirks. People say that they would have preferred to have seen Deku’s story of becoming a hero without the need of inheriting All Might’s quirk, but that would be a different story altogether. That would be a Batman or Ironman story where the superhero is defined by an unwavering spirit for justice. But Deku doesn’t have such grandiose ambitions. His justice isn’t fueled by a desire to avenge his parents like Batman, or a sense of duty to make up for one’s ills towards society like Ironman. 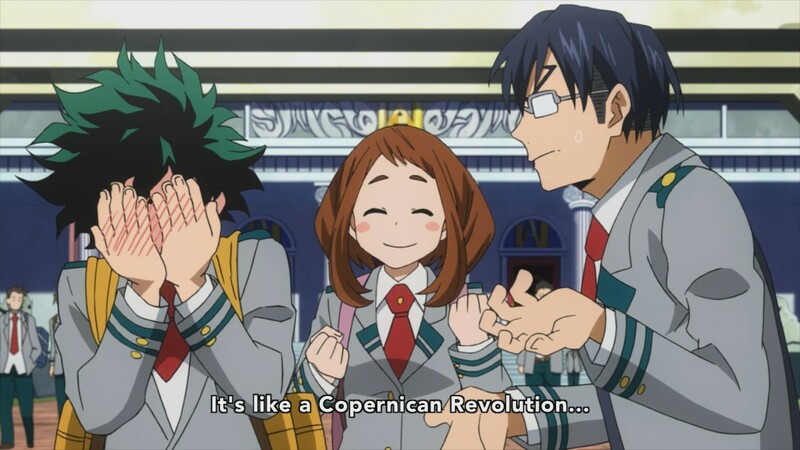 Deku’s character is a recognition that the educational paradigm of hero and non-hero is inadequate in understanding the true value of heroism. We can all become heroes. That’s Deku’s statement. That’s his battle cry. We don’t need a grandiose cause or massive amounts of money and influence in order to become a hero. We can be a hero in even the smallest of ways. And this is why Deku’s character is so important — his name sounding like “dekiru” meaning “it’s possible”. He shows us that anyone can become a hero. 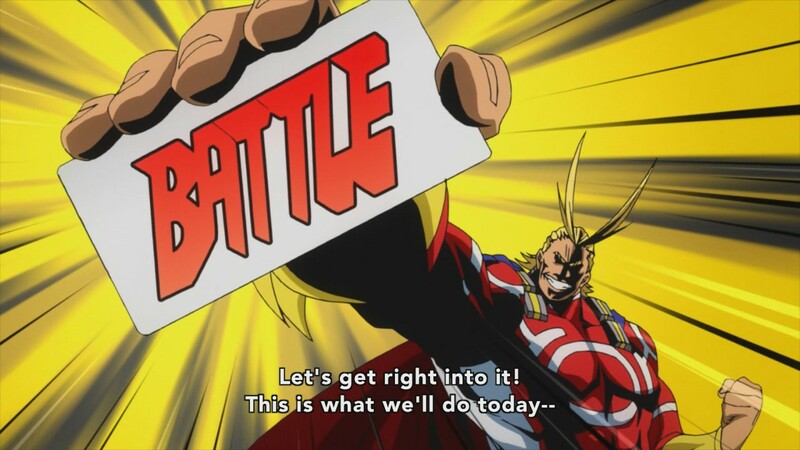 So far, I’ve gone on to talk about how MHA serves as a reflection on the educational institutions that create this sort of intellectual model of the mind and how our paradigms of heroism are branded by a similar need to distinguish between those with power and those without it. But I haven’t really discussed the episode in general. Oops. Well, not much happened in this episode apart from Deku finally delivering some well-earned smack down on Kacchan. But there were also nice moments of note like how Deku’s mom made his suit, and how Deku also shows some amount of respect for Kacchan. Deku is remarkable in his ability to be humble towards those he knows are more powerful than him in in terms of societal structure, but at the same time he knows how to stand up in order to defend his own brand of heroism. So I guess this entry has turned out to be more of an overall look at the core values that the show has espoused in its 6-episode run. It could certainly use a little push in terms of pacing, but I believe what makes me believe in this show in spite of its shortcomings is its poignant message of hope and the power of heroism. Heroism is something that exists in all of us, and by watching the story of Deku, it calls us to bring about our own brand of heroism — a heroism that the world is in dire need of seeing.